that children can put their treasures in. to the other side of the tree trunk. Leave the trunk attached to the box. Have the children paint the inside of the box side of the tree trunk brown. the bottom of the leaves. 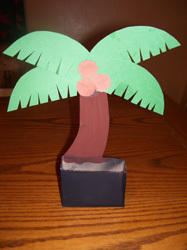 Have them cut coconuts from light brown construction paper. Glue in place. If the tree trunk seems wobbly, glue a craft stick to the back of the tree. Children could keep trinkets in the box.